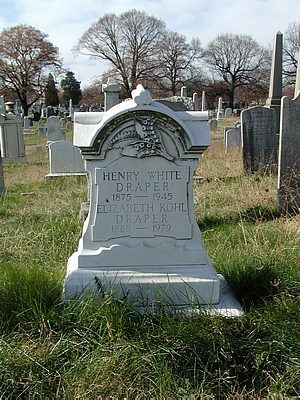 Henry Draper rests beside his wife, Elizabeth, who was Assistant Principal at Hine Junior High School. Educator, historian, traveler, poet and civic leader, born at 1909 Pennsylvania Ave. N.W. , son of an assistant surgeon in the Navy during the Civil War. Among Mr. Draper’s paternal ancestors were twelve signers of the Magna Charta. His mother was a descendant of the Washington ’s of Virginia . Educated in the D.C. schools he graduated from Washington Normal School in 1895, received a law degree in 1904 and an M.A. from George Washington University in 1922. 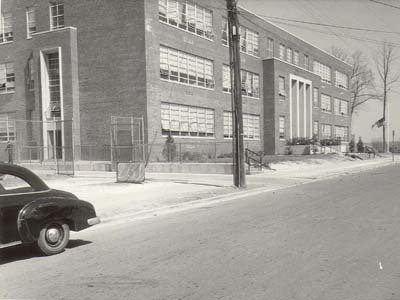 At the time of his retirement in 1945 he had served the DC Public Schools for 50 years. 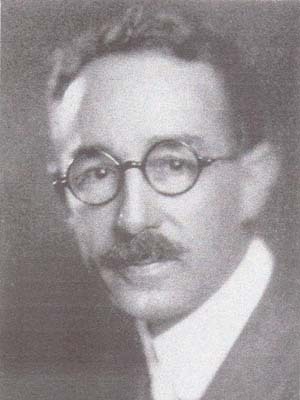 He was supervising principal of the first division from 1927-45. Wahler Pl. & Ninth St. S.E. 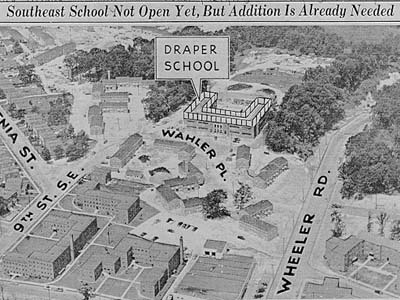 A newspaper article from 1953 highlights the D.C. school system’s inability to keep up with the rapidly expanding school population. When built it already needed another floor to keep up the student population.